Mazal Tov! Your child has almost reached the age of adulthood in accordance with Jewish law and is about to celebrate a Bar/Bat Mitzvah. Since the Bar/Bat Mitzvah was established to allow a young adult to demonstrate a cumulative intellectual mastery of aspects of Jewish tradition, Shaarie Torah has created an avenue that will help your child achieve just that! Coming of age is celebrated in the Jewish tradition by ascending the bima to participate in a religious service in front of family, friends, and the community. This is a very special day. Festivities, food, and much fun reward the child for all of the hard work that goes into preparation and study. But the true practice of Judaism does not begin or end on this day. The spirit of our religion is maintained through the fulfillment of the commandments, and not just in the 13th year. 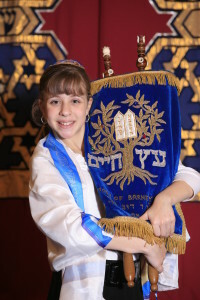 Through preparation of the Bar/Bat Mitzvah, your child will learn the three pillars of in Judaism: Torah, Service, and Loving Kindness, making the Bar / Bat Mitzvah a life-long learning process. Download the information packet here.